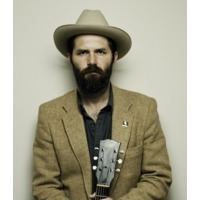 Jeffrey Foucault is a singer-songwriter from Whitewater, Wisconsin. His 2001 debut album, Miles from the Lightning, won much praise from critics and helped to kick-start a career of tours across the United States, Canada, and Europe. Along the way, he has played with such artists as Greg Brown, Gillian Welch, Todd Snider, Chris Smither, and Rosanne Cash. Foucault is married to fellow singer/songwriter Kris Delmhorst. In 2003, Foucault, Delmhorst, and Peter Mulvey released an album entitled Redbird. Foucault's 2004 album, Stripping Cane, was produced by David "Goody" Goodrich, and included collaborations with Redbird's Mulvey and Delmhorst. In 2006, Foucault released his third solo album, Ghost Repeater. Produced by Bo Ramsey, the album includes guest appearances by Dave Moore on harp and accordion and Son Volt's Eric Heywood on pedal steel.